Earlier this summer, I was in touch with Bob Dunsire in the hope that he would agree to be a subject for one of my articles in the "North American Pipers" series. I knew Bob through his wonderful Internet bagpipe forums at www.bobdunsire.com. I had occasionally submitted a comment or two to the forums and after a couple of years Bob kindly extended an invitation for me to become a Forum Moderator, which I reluctantly declined. He seemed such a vibrant, active man that I was shocked when he wrote to tell me that he was losing his battle with cancer and would not have the time to provide me with the information I needed for the proposed article. He passed away on November 6th. I am indebted to Andrew Lenz of California for much of the material that follows and to several of Bob’s close friends and associates for their additional input. Bob was born January 3rd, 1953 in Burnaby, British Columbia to Lily Bell and Ken Dunsire. His father wanted him to learn to play the pipes at an early age, but racing motorcycles was more interesting to him then. A talented athlete, he got involved in many different sports during his youth. He married Diana Anderson and, while living in Pleasanton, California, they gave birth to two daughters, Alison and Elizabeth, who would later become excellent pipers. Bob’s sister Barbara married Robin Belanger, a piper, and their daughters were Highland dancers so the two families spent time together when the Belangers came to California to attend the Pleasanton Highland Games where Bob entered some of the Scottish heavy events. Later, he decided he would like to learn to play a few tunes on the bagpipes. Robin Belanger was Bob’s first piping teacher. There were difficulties, however, as Robin lived in Illinois and their lessons were conducted with cassette tapes, telephone calls and occasional visits. As he learned, Bob’s daughter Allison developed an interest and she became his first student. Later on, when she had reached the Professional level, she began to teach her uncle Robin, thus completing that circle. Bob’s first goal was to learn to play just for fun. Once he started, however, the thrill of learning something new and exciting took over and he threw all his efforts and energy into it. He decided to give himself seven years to try to reach a Grade 2 Amateur level of performance. Competition was a means of testing himself. It was doing your best that counted, not beating someone else. Though time ran out for him, he did reach Grade 2 before the first of several surgeries on his spine brought his competitive piping to an end. After living in California for almost thirty years, Bob moved his family to Camano Island, Washington, in 1998. His oldest daughter Alison joined the Robert Malcolm Memorial Pipe Band, the excellent junior contingent of the world famous Simon Fraser University Pipe Band. His younger daughter, Liz first joined the Northwest MacGregor Pipe Band in Mt. Vernon, Washington and later moved to the RMM pipe band with her sister. Although he could no longer play the pipes himself, he knew his daughters were in it for the long haul, and he wanted to stay involved too. Back in 1975, he had begun a career in the computer and software field. When the Internet arrived, he found a new hobby. He started building web pages in 1995 and, by 1998, had created more than 100 websites, each a little different and perhaps more advanced then the ones that went before, as he honed his skills in web design. In Camano Island, he thought of creating a website for pipers and The Bagpipe Directory was born. At the suggestion of Terry Lee, Pipe Major of the SFU Pipe Band, and with financial backing through Terry’s business, Tartantown, Bob decided to start a bagpipe discussion site and this led to the creation of his famous Bob Dunsire Forums which has attracted interest and discussion on piping topics from 10,000 forum members from around the world. Through his forums, Bob became one of the household names in the piping world today. He passed away in his home on Camano Island, Washington on November 6, 2006, surrounded by his loving family. Bob is survived by his loving wife of 23 ½ years Diana, and daughters Alison and Elizabeth. Willie Galbraith (Wulls), owner and operator of the piping supplies company called Chanters Direct, became very good friends with Bob through the Forum. 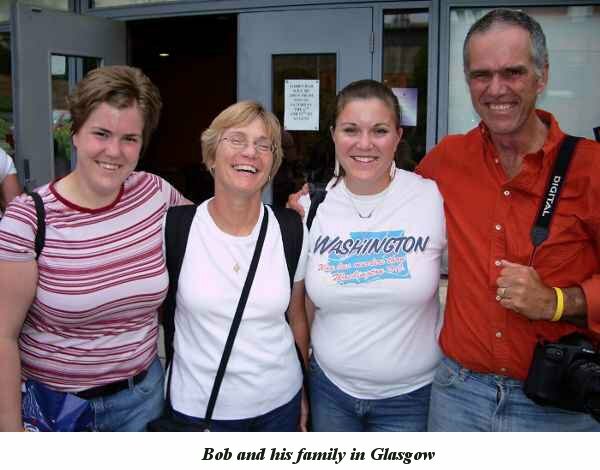 He writes from Scotland: "Back in November 2002, I was surfing the Internet for info about something piping related and stumbled across Bob’s site. What struck me was the sheer amount of information available – for free! You could even log on with a hotmail or yahoo account so there was no tracability. I immediately thought, "A-hah! First mistake." But after using the Forum for a while, I realised that Bob Dunsire had set up something special - a site where pipers and drummers could actually communicate worldwide with the minimum of policing. In general, the standard of the communication was extremely high. I remembered "older" websites as being undisciplined, irresponsible, uncouth rabbles but this one was different. Why? The answer is Bob Dunsire. "Over the years I have known Bob, he came across as a mannered, intelligent, funny, considerate person. His disarming way of defusing potentially serious "spats" on the forum was enlightening to me, being a more confrontational type of person (Scottish?). In short I was hooked. Bob approached me to consider helping as a moderator on the Forum. My first response was to refuse, as I honestly believed I was not the type of diplomat that the Forum needed, but after a lot of emails I agreed and only when I came aboard the Mod team did I realised what an ambassador of piping Bob really was. His attitude was always well balanced and fair. The closest he would ever go to berating some Forum Rules offender publicly was to admit to sending the person a "note". "I first met Bob in the flesh two years ago when the Dunsire family were over for the World’s. We spent a brilliant day out in Dunblane. We had an ongoing laugh with the "lucky bunnet". When Bob’s cancer was first diagnosed I sent him over my "see you jimmy" hat. If you are not aware of what that is, Google it. It was meant as a good luck charm and something to let Bob know we were all thinking about him. I had worn it many times to Scotland’s international football matches and the lucky bit was the notion we had that I never wore it to a match they lost. Bob wanted to return it in person when the cancer was in remission, hence Dunblane. When the news came that his cancer had returned, I was over in Italy for the Scotland versus Italy match where Italy thrashed Scotland. The lucky bunnet seemed to have finally run out of steam. It was last seen disappearing into the distance tied onto an Italian petrol tanker in Turin. I sent Bob over a new "lucky bunnet" of his own and he seemed to enjoy telling friends and family the story. "The bottom line was that by then Bob was on a time limit. I did not want to wait until the inevitable and take a trip over to a funeral, so Ken MacKenzie, Ian Lawther (both Moderators of the Forum) and I set up a visit to try and cheer Bob up a little. I flew to Seattle where Ken and Ian met me and it was only then that we heard that Bob had been readmitted to hospital. Ken and I stayed the night in a motel and we all invaded the hospital the next day. The look of surprise on Bob’s face was priceless, and his first comment was, "Holy cow, you guys!" We only stayed a few short hours but Bob seemed to appreciate our visit. "The whole trip involved four cars, a ferry, a bus, a floatplane, six different aircraft (seven counting the puddle jumper) and five different airports. It was a standing joke that we couldn't find a dog sled. It was entirely worth it to see Bob smile a little, and possibly an indication to Bob of the esteem in which we all held him. I suspect he knew." Robert MacNeil, President of the BC Pipers Association writes: "I want to acknowledge the work Bob did for our Association, for it was as transformative as his other Internet piping initiatives. 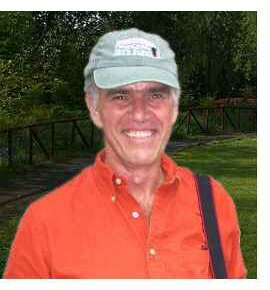 In early 1999, I recommended to the BCPA Board of Directors that Bob be our Webmaster. At the time, the BCPA was lagging behind many pipe band associations by being one of the few without an Internet presence. Bob brought our Association into the Internet age with a perspective ahead of its time for pipe band associations. He recognized that competition results were "news" and competitions/Highland Games were "visual events". He knew that people wanted current news and wanted it promptly. He knew people wanted to see images of the events they participated in and for those who couldn't attend, a flavour of what it was like to be there. To realize his vision, Bob and I set a standard to meet: Get the results and pictures of BCPA sanctioned competitions up on the BCPA website within one day of the competition ending. We worked as a great team, but we also treated it like a race, i.e. who could get their part done first. Bob almost always won but when I did, I put a note in the email to him with the results saying "Beat ya!". We always had a good laugh about those times because it never was Bob or I who won but our members, as they received the fastest accurate information and images we could deliver them. "In a pioneering initiative, Bob implemented the online payment system whereby any BCPA payment activity (membership, event entry, tickets, merchandise, etc) can be done online via credit card payment. He was very proud to make the BCPA the first (and still the only) pipe band association in the world to offer online payment for all its services. "The BCPA Board of Directors is very thankful for the service Bob gave to our Association and its members. He exemplifies how great volunteers can transform organizations to better meet their mission, to serve members in ways they appreciate, and to make members proud of the work of their Association." Piper, moderator of one of Bob’s Forums, and close friend Ken Mackenzie, formerly of Pictou County, NS, now of B.C. wrote: "I wonder if you know that Bob actually competed at the Antigonish Highland Games, sometime about 1996 or ‘97. I'm not sure what grade he played in, but he played for John Walsh and I recall him remarking that all the other competitors in the class were pre or early teens. The picture of him on his web directory site was actually taken in Antigonish on that occasion." Ken submitted the notice to the Bob Dunsire Forum on behalf of the family, which read in part, "Bob was a kind, loyal, and passionate man. He was actively involved in a variety of sports from childhood including running, motocross, water-skiing, and windsurfing. Later in life, Bob learned to play the bagpipes and, when he was no longer able to play the bagpipes, he stayed involved as a very proud parent and by building and maintaining www.bobdunsire.com, the most comprehensive bagpipe site in the world. He also enjoyed playing the piano, flying giant scale RC airplanes, and playing with and training his Border collie, Sparc. He will be remembered as a loving father, son, brother, husband, and friend. Those of us lucky enough to know Bob and be touched by him will remember his goofy sense of humour, his laugh, and the way his entire face lit up whenever he was talking to or about ‘his girls.’"
Internationally renowned piper, Jack Lee had this to say: "Bob Dunsire had a tremendous life. He lived it to the fullest, touched many people, inspired and helped thousands and was taken from us far too young. Bob threw himself completely at the things he loved to do: family, bagpipes, photography, remote-controlled aircraft, and bare-foot water skiing to name only a few of his favourite pursuits. He adored his family. His wife and daughters have lost an incredible husband and father. "I will always remember the way Bob moved his family to the Pacific Northwest. The Dunsires were living in the San Francisco area and the girls were young, promising pipers. Bob was looking for the best opportunity that would help them along. When he heard of the Robert Malcolm Memorial Pipe Band near Vancouver it really clicked for him. The Dunsires moved all the way up near the Canadian border just so the girls could receive top-level instruction. Alison and Liz really flourished there. Both went on up through RMM's Grade 4, 3 and 2 bands and competed in Scotland, winning the World Juvenile championships. Both girls represented the BC Pipers Association at the George Sheriff Invitational solo competition in Hamilton, ON. "Bob's work on the Dunsire Forums is legendary. He was the first person in the world to really understand the potential of the Internet for pipers at all levels. The Dunsire Forums are a great legacy to Bob and, I suspect, will continue to grow and be enjoyed by many. His "Photo of the Week" was a must-see for many of us - always great fun." Tributes from all over the world can be found on the "In Memoriam" page on Bob’s forum site. Jim McGillivray of Aurora, ON wrote: "Few but the moderators may know the tremendous judgement Bob executed behind the scenes here. When new ideas, problems, or problem posters surfaced, Bob requested and received lots of input from the moderators and then made a decision about what to do, always taking action and always taking responsibility. His decisions were almost always right on the mark, and this impressed me no end. So Bob had not only the impetus and technical skill to start projects such as this Forum, he had the sense of teamwork, the leadership skills and knowledge of people to keep it all functioning at a high level for a long time. Bob's contribution has very much been part of the modern age, and therefore very unique in piping and drumming. Many of us would do well to emulate his passion, his commitment and his style." Ian Sherwood of California wrote: "A sad day for pipers everywhere. Bob brought so many of us together here (i.e. in the Forums) - no acrimony, no sniping, just good interaction between pipers on the Net. We will all miss him, but this website stands as his legacy to the piping world." A forum member from North Lanarkshire, Scotland: "The pipe band community has never been as close-knit and friendly as it is now and Bob made that happen through his endless hours of hard work and devotion to building the bobdunsire.com community that we enjoy today." From Allison B., Louisiana: "It's amazing how a man I never met had such a huge impact on my life. I'm sure there are thousands of people out there thinking the same thing right now." From Karl Chang in Konstanz, Germany: "Bob's Forum has brought me into the world of bagpiping." From David Marshall, of Waterloo, ON: "I went back and read the last email I had from Bob. He ended with "...still loving life!". This was a bit of a tag line for him, but I think it was every bit true!" From Grant L., in Mukono, Uganda: "Thanks, Bob. These Forums are a Godsend to pipers and drummers everywhere, but especially to isolated pipers. You set a high standard for civil conduct, held us to it and resolved conflicts and disagreements as they arose. Thanks to you, this diverse and opinionated group of people has become a family, which crosses national boundaries. People I have never met in person have provided help and advice in so many ways." From a Forum member in Dubai: "Most of what I have been able to learn on piping from here has been through the BDF (Bob Dunsire Forums). I will always be grateful to Bob for having allowed this. He certainly should have been glad to see the 10,000th forum member knocking at the door later this month, and many more…"
The SFU Pipe Band played a number of pieces at the service to honour Bob. Jack Lee reports: "Bob's funeral was an intimate and wonderful event. All in attendance were touched and there were very few dry eyes during the service. He was adored and admired by so many people. If 1/4 of the nice things that were said about Bob that day were some day said about us, we would consider our lives to have been successful."